Meng and Melinda Chan, together with two other photographers, were out around the Lim Chu Kang cemetery area on the morning of 6th March 2005 to document the arrival of the male Black-shouldered Kite (Elanus caeruleus) bringing food to the female who was usually sitting in the nest incubating her eggs. The large nest of twigs sat firmly lodged between the end branches of a tall tree, totally exposed all around. What they witnessed was a sad spectacle. 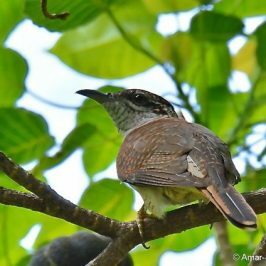 The presumably female bird was perched on a branch near her nest, calling loudly. 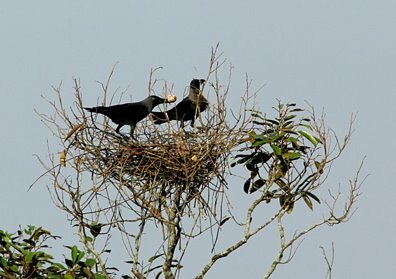 This was unusual, as she was always in the nest, guarding her eggs from the constant threat posed by the many House Crows (Corvus splendens) that were around. 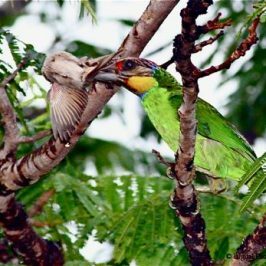 The bird then flew to a further branch to join its newly arrived mate. 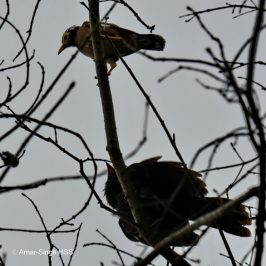 They remained there, not returning to the nest. This was again strange, as they seldom, if ever, left the nest and its contents unguarded. Were the birds stressed in any way? They must have been! 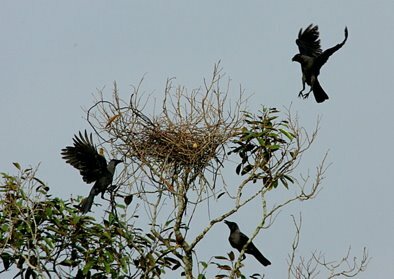 The crows swarmed over the nest, screaming loudly. They zoomed in one by one to fly off with the contents, including a fully formed embryo and egg shells. Meng and Melinda then realised that the adult kite they saw earlier, crying out loudly, was in fact crying in sorrow, knowing that the eggs would not complete their cycle and they would not see any nestlings. Not too long later, when Ming and Melinda returned to the scene, they found the abandoned nest collapsed. 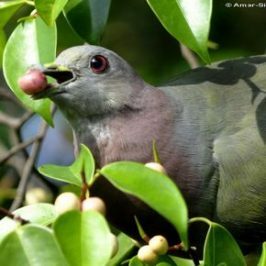 But eight months later (November 2005), they found a pair, possibly the same pair, nesting again at the same location, but on a different tree. The crows were a constant threat and the kites had to fight them off all the time. As it was the rainy season then, they did not have much chance to monitor the nesting. The very last time they saw the nest, it was abandoned and was in a bad condition, probably another failed attempt at nesting. 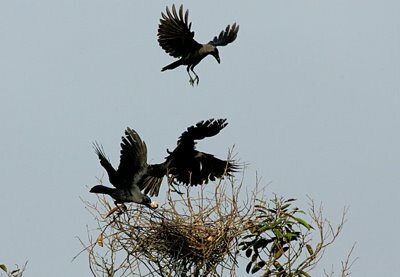 Our bird specialist, R. Subaraj has this to say: These are fantastic dramatic shots that show clear proof of the threat the introduced House Crows pose on native birds. A flock of crows is quite capable of driving a kite off it’s nest to raid it. From one of the image, you can see that the Black-shouldered Kite is actually quite a small raptor compared to the corvid. 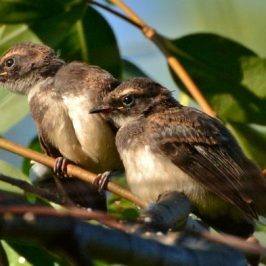 As our grasslands shrink and the crow population increases, it becomes more and more difficult for the Black-winged Kites to successfully raise a brood. This in turn is a serious threat to the species in the long run. Note: A detailed account of these kites and their antics when the parent birds arrive with food is given elsewhere by Hilary Hoe. Text and images by Meng and Melinda Chan. But as the black-shouldered kite and the house crow are sympatric over much of the house crow’s native range, I wonder if this is enough of a significant threat to the black-shouldered kite. 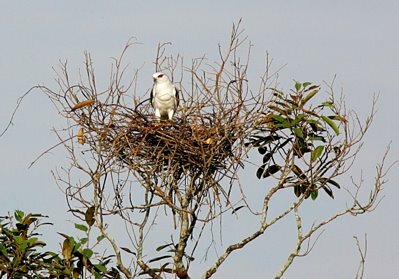 Although human pressure might be another factor to take into account, since destruction of suitable and secure nesting sites for black-shouldered kites might make them choose sites more vulnerable to attack from house crows. 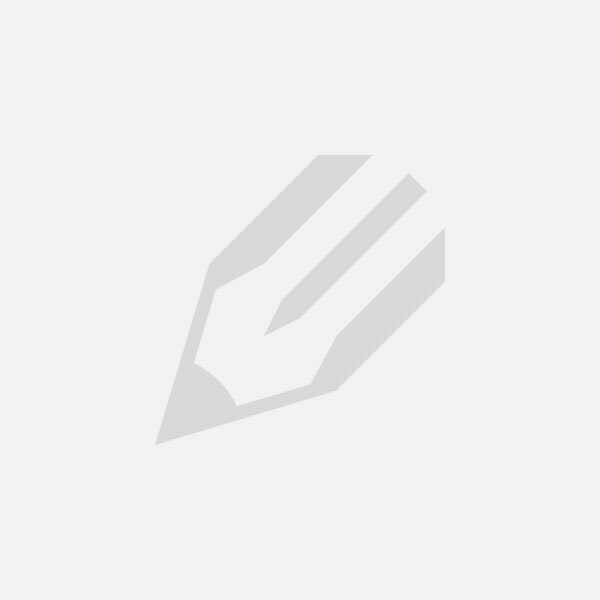 Hello there This is a really great website. I was quite impressed with the work that you have done here. I just wanted to send you a quick message that I have really enjoyed it. 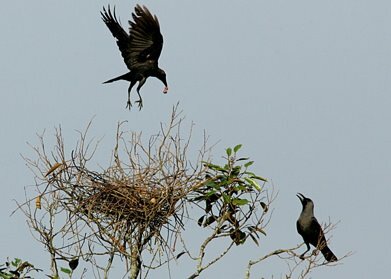 Culling of crows is common in Singapore. Why wasn’t there a call to AVA to cull these crows to save the kites? It’s not as though we have many kites here. Once again, the intelligence of crows amazes me. They are capable of working alone, as well as, as seen here, conspiring with others of their kind to launch a group attack, which requires planning and coordination. 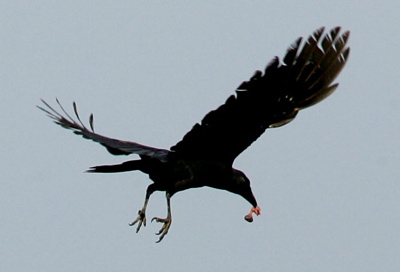 I am really interested in how the crows do this. As Meng says, “the crows launched a concerted attach [sic]. [They] came in waves, like Japanese kamikazi pilots flying their planes in a series of attacks.” Surely this can’t be random? And if it isn’t random, then it must require planning and coordination, if you see my point.